Nothing more than that info so far. I would imagine similar if the Houses of Parliament were to go up. 1870 fire surpression systems weren't what they are today. "What does that mean for world history?" asks CudzoJnr. Well, it means Notre Dame is "history" though I'm sure they'll rebuild it. It was crumbling badly and undergoing renovation. It's on fire all right! Edit: "A glimmer of good news: all the artworks in #NotreDame have been saved, according to the ND priest. The treasure of the cathedral is intact, including the crown of thorns and the holy sacraments. Here’s hoping that the exterior structure will remain standing"
It'll have been a timber roof structure and masonry walls. I hope my favourite gargoyle survives. They rebuilt York Minster and (also burnt just as renovations were finishing) Uppark. My (ex)wife and I (Don't ask) were on the roof in the course of our honeymoon. The vaulted ceilings are stone. The roof structure sits on top of the masonry like a hat. I had a tour of Reims Cathedral in 1999. That had burned down in WW1, and the roof timbers were replicated in reinforced concrete to make it more fireproof. It was quite something to see pegged mortice and tenon joints in concrete. 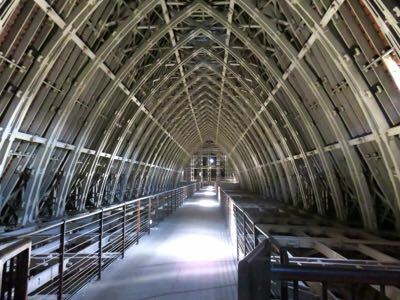 One of the interesting features of the tour is the chance to go under the roof framework and walk the length of the building. This magnificent structure, originally done in wood, was destroyed by fire in World War I. The lead in the roof also melted and dripped out through the gargoyles. The structure was rebuilt with support from the French government and John D. Rockefeller Jr. The current roof structure is made of reinforced concrete. The entire building suffered significant damage during the war, and for a time the plan was to convert it to a memorial. Fortunately, the cathedral was restored and it re-opened in 1938. Gargoyles spewing molten lead. Now that would be quite a sight. The roof structure sits on top of the masonry like a hat. 'Tis in the nature of roofs. I'm so very very upset by this. For three years I lived in a little apartment on L'île St Louis, just a couple of hundred metres from Notre dame. I walked past it every day. I sat in it on the occasional afternoon for organ practice and (non religious) contemplation. I'm so worried about the rose window. Reports I've seen suggest its not survived.. uncorroborated so far. On a smaller scale, there are good reasons why there are insurance policies to cover having your house renovated. Its that bloody Quasimodo smoking in bed, innit? Major museum in Brazil as well and Windsor Castle. The forthcoming rebuild of Notre Dame won’t be the first, but that doesn’t reduce the feeling of lose when seeing the pictures. Hopefully the firefighters will be careful of their own safety though, because no matter how old or revered a building it is, it is only a building which can replaced. A firefighters life less so. It seems that the vaulted stone ceiling is mainly still intact. The wooden roof above it is gone, but amazingly the falling bits of roof didn't take much of the stone ceiling down.